In principle, the larger a telescope's mirror, the finer the details it can see. Techniques such as adaptive optics and active optics, both used by ESO, can unleash the full potential of a big mirror. Adaptive optics helps to counteract the effects of atmospheric turbulence, and active optics is used to steady the main 8.2-metre mirrors of ESO's Very Large Telescope (VLT). These two powerful techniques enable the four Unit Telescopes of the VLT to discern details as fine as 50 milliarcseconds, which is equivalent to the size of a two-euro coin seen from 100 km away. A telescope's ability to discern details is known as its resolution. Continuing to increase the size of telescope mirrors is not an easy task, so astronomers have come up with a new technology to see even finer details: interferometry. 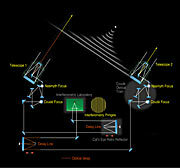 This observational technique combines the light received by two or more telescopes and allows them to act as a single unit with a mirror diameter equivalent to the distance between the telescopes. Engineers designed the VLT so that it can also be used as an interferometer. Along with the four 8.2-metre Unit Telescopes, four mobile 1.8-metre Auxiliary Telescopes (ATs) were included in the overall VLT concept to form the Very Large Telescope Interferometer (VLTI). The ATs can move between 30 different stations, and at present, the telescopes can form groups of two or three for interferometry. A complex system of mirrors brings the light from the different telescopes to the astronomical instruments where it is combined and processed. This feat demands stunning technical prowess ― the light paths must be kept equal to within 1/1000 mm over distances of a few hundred metres. For the Unit Telescopes, this gives an equivalent mirror diameter of up to 130 metres, and when combining the Auxiliary Telescopes, equivalent mirror diameters of up to 200 metres can be achieved. This is up to 25 times better than the resolution of a single VLT Unit Telescope. The VLTI gives astronomers the ability to study celestial objects in unprecedented detail. It is possible to see details on the surfaces of stars and even to study the environment close to a black hole. The VLTI has allowed astronomers to obtain one of the sharpest images ever of a star, with a spatial resolution of only 4 milliarcseconds. This is equivalent to picking out the head of a screw at a distance of 300 km.